December, 2011 - This picture was taken at the BCGEU offices in Burnaby when various Seniors Organizations met with BCGEU President Darryl Walker on December 12, 2011. 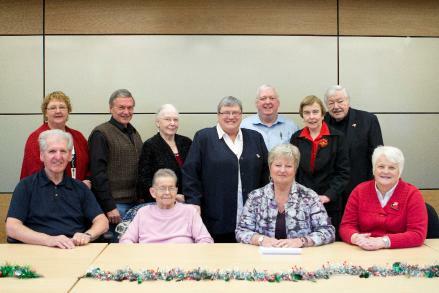 The organizations represented were Council of Senior Citizen Organizations BC (COSCO), BC Government Retired Employees Association, with Diane Wood representing BC FORUM in her role as Board Secretary and as a representative on the Forum Board representing BCGEU. Labour Day 2011 - BC FORUM Board members Bill Silvester, Vice President, and Diane Wood, Secretary, attended the 2011 Labour Day Festival that took place in Vancouver at Robson Square where they volunteered to bring information about BC FORUM to those in attendance. To view the video, click here. 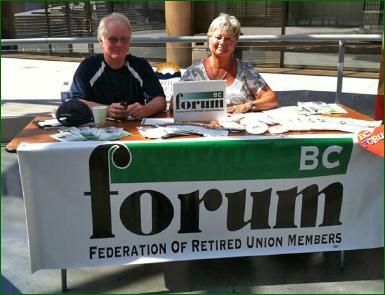 May, 2011 - Lynda Zorn, BC FORUM member and delegate to the North Okanagan Labour Council, made a presentation on behalf of BC FORUM at a public engagement event in May, 2011, that was part of the BCGEU's launch of their provincial campaign “Build A Better Future for Seniors”. 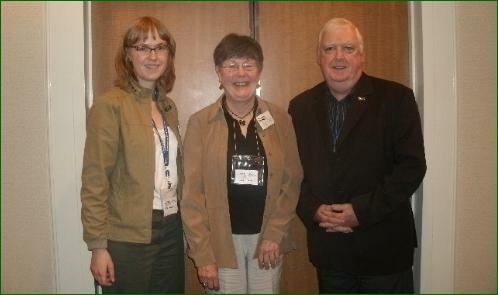 She is shown above, center, with Anita Zaenker,Staff Representative, Research and Campaigns, BCGEU and Darryl Walker, President, BCGEU. In response to growing concerns about the state of seniors’ care in BC—reflected in the media, research reports, and the everyday lived experience of our province’s seniors— the BC Government and Service Employees’ Union (BCGEU) recently launched a provincial campaign to Build a Better Future for Seniors. Because the seniors’ population in the Okanagan area exceeds the provincial and national average, Kelowna represented a model community from which to draw on experience and expertise around this issue. 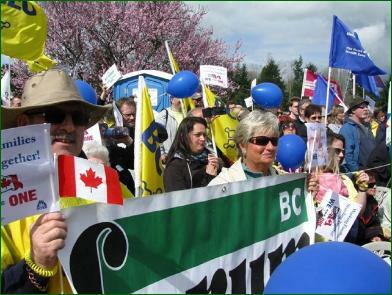 Numerous campaign activities took place in the region throughout May, 2011, including a public engagement event on May 30 in Kelowna. Nearly 60 key stakeholders from the area’s seniors’ care sector participated in this event. Read more about this campaign, including the report, here. April, 2011 - BC FORUM Secretary Diane Woodand member George Foisey joins with thousands of labour activists at the International Solidarity Rally that took place at Peace Arch Park at the Canada-US border on April 2, 2011, to show support for public service workers in Wisconsin who have lost collective bargaining rights as a result of state government actions.